5:24 No alarm clocks out here. That’s right. You can leave your phones unplugged and wake up to the sound of our crew brewing “coffee!”, the scuffling sounds of camp waking up or that delicious feeling of the sun warming up your tent walls. 7:02 Do I smell coffee? If opening your eyes to the beauties of nature isn’t enough of a wakeup call, a cup of fresh coffee, tea or cocoa will do the trick. And doesn’t coffee always taste better when you aren’t the one that makes it? 7:36 Get your pancakes hot off the griddle. Sit back and enjoy the river rustling by as our staff cooks you up a hot, fresh breakfast. Our adventure-loving staff puts the heart in hearty as they dish up sausage, pancakes, eggs—oh my! 9:30 Heave ho, it’s time to go! You’re dressed for adventure, the gear’s packed, and you hear the rasp of the raft as it launches from the sandy beaches into the awaiting river. 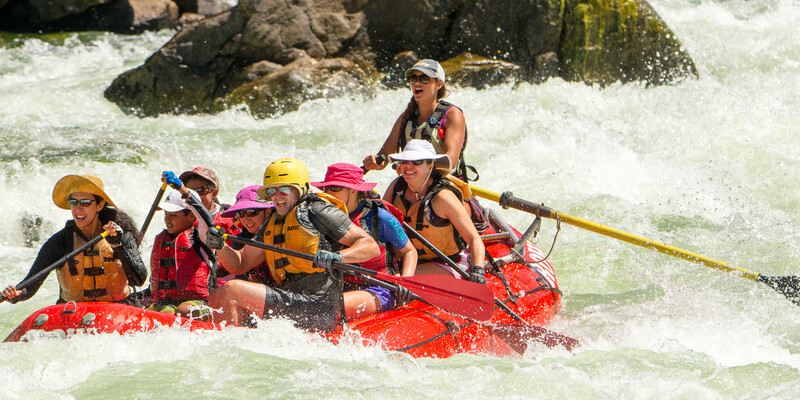 The best part of a whitewater rafting trip is that there’s no telling what adventures may happen as you discover dips, bowls, and eddies. It may be nature’s roller coaster, but there’s no track, no loop, and no waiting line! 10:47 Side trails: the adventure you didn’t see coming. There’s plenty of secrets to be discovered off the river, whether they are hidden natural pools where you can relax with a swim, abandoned settlements or prehistoric paintings that decorate canyon walls high above. You never know what you may find by following a side trail and what piece of history you can uncover. 12:16 Secret ingredient: fresh air. Everything tastes better with a side of fresh air. Whether it’s the lunch spread you get to indulge in while you take a rafting break or the laugh that spills out of you as you jump from a rock into the waiting pool below. It’s that natural, all-organic secret ingredient that makes your rafting adventure soul-sustaining. 2:18 Time to cool off. Sure, you may be sporting some awesome water-resistant clothes, but that’s no reason you can’t get soaked and cool down. King of the raft! Frisbee! Beach volleyball! Naptime? Afternoons are for whatever shoreside adventures float your boat. Play hard, nap easy and make stories. 4:43 Take a turn on the raft slide. So by now, you know that river rafting is nature’s roller coaster, but now is the time to discover a whole new kind of waterslide. Step 1: flip the raft. Step 2: Get some momentum. Step 3: Slip, slide, get some air. Step 4: Smile big as you get a face full of gloriously non-chlorinated river water. Sit back and sip on the beverage of your choosing as you sink your toes into the sand. There’s views, hors d’oeuvres, great company—and you can wear sweatpants if you want to. Win, win, win. 7:00 Dinner with a view. Our river chefs have done their magic so you can sit down to a freshly prepared, gourmet dinner. No reservations needed for this special outside seating. 8:28 Campfire stories last forever. Please, sir, I’d like s’more! Grab yourself a graham cracker and make up your s’more your way. Burnt or lightly toasted? Dark or milk chocolate? How about a dollop of peanut butter for you crazies out there? Then listen to the stories go round n’ round the circle. 10:04 Can you spot the slice of pizza in the sky? Well, we can’t all claim to be astronomers. But it’s still fun to spot pizza slices and strings of stars that may or may not be part of Orion’s belt. Constellations aside, the night sky teems with stars made brighter without their artificial nightlight rivals. Lay back, listen to the lull of the river and enjoy feeling lost in wonder. What’s around the river bend tomorrow? Will, you take on a famous rapid, work on your new raft-slide skills or try out an inflatable kayak? Dream whitewater dreams, then enjoy whitewater realities tomorrow. Stephanie is a writer and content manager for ROW Adventures, Sea Kayak Adventures and Adventure Unbound.